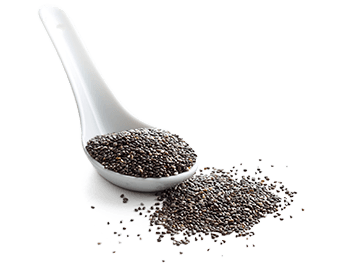 Chia is rich in Omega-3 fatty acids and is grown commercially for its seed. These seeds yield 25–30% extractable oil, including a-linolenic acid. Mottle-colored with brown, gray, black, and white, chia seeds absorb up to 12 times their weight in liquid when soaked, which helps maintain satiety. With more Omega-3’s than flaxseed, just one ounce (about 2 tablespoons) contains 4 grams of protein, 9 grams fat, 12 grams carbohydrates and 11 grams of fiber, plus antioxidants, vitamins and minerals such as calcium, manganese and phosphorous.